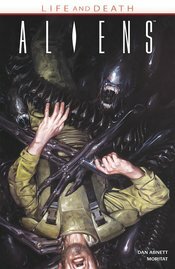 Barely escaping from a world overrun with Aliens, a squad of Colonial Marines discover that one of their number is still planetside-a prisoner in an Alien hive. It's time to man up, gear up, and head back to the Alien-infested planet. The marines leave no man or woman behind! Collects Aliens: Life and Death issues #1-#4..